It's a great update that will get even better soon. After a late night at the office, I hopped on the subway and noticed something unusual: My Pixel 2 suggested I listen to some new Capital Cities tracks in Spotify. I took Android's advice, and while it didn't dramatically shift the trajectory of my day, it was still a pleasant, unexpected diversion. Android 9 Pie is a massive, AI-infused software update, and it’s generally a pleasure to use. The handful of features made possible by machine learning are helpful additions, but there’s much more to Pie than that. Google has done a lot nipping and tucking to make Android itself easier to use, and some system-level changes give the platform room to grow in some important ways. Not everyone will love the changes Google made here -- power users in particular -- but overall, it’s a thoughtful, worthy update that will only get better when even more features arrive later this year. How would you rate the Android 9.0 (Pie)? That's all because Google built Android 9 Pie to pay more attention to what you do, and to help out accordingly. That suggestion wasn't random: It was based on behavior that Android picked up on. Beyond that, there are plenty of important system-level improvements and a handful of tweaks that make Android more pleasant to use. There's still plenty of work to be done, but after using the update (in its various forms) for a while, I can confidently say Google's efforts are paying off. If nothing else, Android Pie is the most thoughtful version of Android I've ever used. 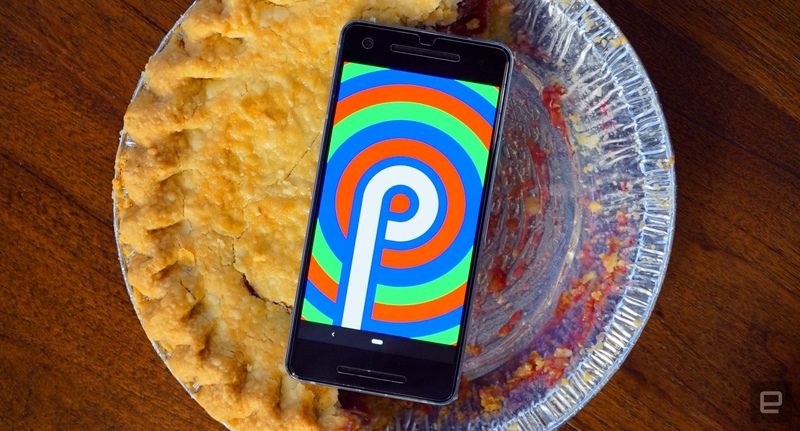 Android Pie officially went live August 6, 2018, and as I write this, only a handful of devices have actually received the update: It's basically just Google's Pixel phones and, strangely, Essential's PH-1. That a brand new version of Android would hit a non-Google phone on day one is pretty unprecedented. Don't get excited, though. That doesn't necessarily mean fans of LG, Samsung or Motorola will get the update any sooner. Essential has very close ties to the search giant through its founder, Andy Rubin, so everyone else still has a wait in front of them. Once you're done updating to Pie, you'll notice ... well, not a whole lot, at first. In fact, one of the biggest changes to the Android experience — Google's new gesture navigation scheme — isn't even on by default. A quick trip into the settings will remedy that. Once enabled, the three standard Android navigation keys are replaced by a Back button and a new pill-shaped home button you'll be spending a lot of time with. 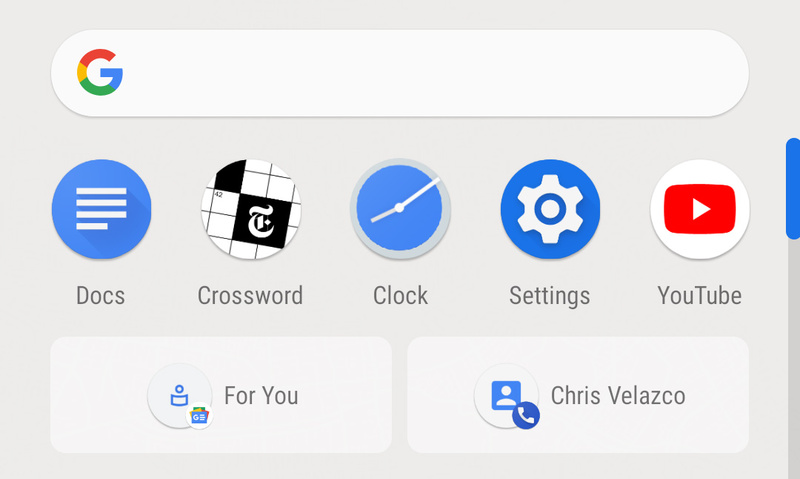 Flicking that home button to the right brings you back into your most recently used app, and it didn't take long for that gesture to become a) second nature and b) totally crucial to how I use the Pixel 2. Swiping up on that button reveals the brand new app switcher. Your apps now appear as a row of cards. You can either swipe around normally or thumb through them by sliding the home button left and right. More important, these app cards aren't just images — you can interact with them. You can even copy and paste text between them, which makes furious multitasking is a little easier. Once you're done with all that, one more swipe up brings up the familiar app launcher. A slower, more deliberate swipe can bring up the app launcher from the get-go, but it's easy to get things mixed up in the heat of the moment. If this all sounds a little convoluted, well, you're right. I got used to Google's new gestures, but they're not as elegant as I would've hoped. I still accidentally open the app launcher when I mean to fire up the app switcher instead, and I know I'm not alone in that. Anyway, pulling down the notifications shade reveals even more changes. The Quick Settings panel on top of all those notifications is now full of round icons that don't expand to offer more options like they used to. They're just toggles. I can live with that, and I'm sure most others can, too, but I know at least a few power users who will be downright pissed that Google is removing truly valuable functionality. The notifications themselves don't look dramatically different, but they offer finer control over what demands your attention. If you press and hold on a notification, you can prevent the app in question from generating notifications altogether. I like to call this the "nuclear option" because it completely shuts an app up (but sometimes that's the best option). Even better, Android Pie can tell when you routinely don't interact with notifications from certain apps and occasionally asks whether it can tell those apps to buzz off entirely. Dig a little deeper and you'll find even more controls — you can pick which apps make sounds or drop down from the top of your screen. It'll take a bit of work, especially if you have a ton of apps, but you can eventually completely customize the way notifications work in Android Pie. These are some pretty hefty changes, but some of Google's most valuable tweaks are actually quite small. The volume keys now control media volume by default, so the days of accidentally putting your phone on vibrate while waiting for a video to load are over. You can take screenshots by holding down the power button and tapping the settings button, and new tools let you mark up those shots before you save or share them. And if you're the kind of person who prevents your phone's screen from rotating, you can tap a new button that appears in the corner of the corner to temporarily force a switch. If nothing else, this has made my nights reading in bed infinitely less frustrating. Lens, Assistant, Duplex — it's no secret that Google believes artificial intelligence is the way forward. What's really interesting about the way Google wove AI into Android Pie is how subtle it is. None of the features we're about to discuss are conceptually very exciting, but there's little question that they make day-to-day life using Pie more pleasant. Consider the subway ride I mentioned earlier — that's an example of what Google calls App Actions. See, Android Pie basically keeps an eye on what you're doing and when, chews on that data for a while, and brings those actions directly into the phone's app launcher when they seem appropriate. Emphasis on "appropriate." In my experience, seeing an App Action pop up on my phone was actually quite rare. Google seems to have prioritized the quality and timeliness of these suggestions over quantity. That said, it does take a while for Android to figure out what you actually want to do and when, so its first few suggestions might not make a whole lot of sense. While we were filming our video review (which you should definitely watch! ), Pie suggested I listen to a Japanese band in Spotify, or, uh, call myself. Things have gotten slightly better, though, leading to pleasant surprises like the one I had on the train. Honestly, though, Google's machine-learning chops are better put to use in other ways. Let's say you're the kind of person who enjoys catching up on your Instagram feed over drinks at the bar. With the Adaptive Battery feature enabled, Android Pie will basically look at that behavior and "learn" to prioritize performance for apps like Instagram you use most frequently and at the correct time. On the flip side, that also means apps you rarely use won't wake up the phone's CPU as frequently (if at all). This, too, takes time to really get going, and I'm not sure I'm there yet with my Pixel. Anecdotally, the phone seems to last a little bit longer (think an hour or so) than it used to while running Oreo, but it's too early to tell whether that's because Adaptive Battery is working or if Android Pie is just more efficient. On the other hand, Adaptive Brightness already seems to be helping out. Long story short, Android Pie keeps tabs on when you fiddle with your screen's brightness and commits it to memory for when the right circumstances crop up. I often work late nights at the office, and it gets pretty dim once everyone is gone, so in the past, I've been quick to dial up the brightness just a bit. (My boss thinks this is weird, but just let me live my life, Terrence.) Thanks to Adaptive Brightness, my Pixel is now much better at increasing the brightness to the levels it knows I've used before. Meanwhile, a new feature called Wind Down lets you define your off-hours. When the time is right, the phone's screen turns gray. Everything still works the way it's supposed to so you can keep chugging along if you choose, but in my time with the feature, it's been great at dissuading me from putzing around with my Pixel past 11PM. Of course, this requires the self-control to keep yourself from manually turning off the feature — Digital Wellbeing can't cure the most dedicated addicts. We've run through loads of features, but we're not through the list yet. An update this substantial also comes with a load of system-level enhancements that won't be immediately obvious to most. So let's run through some of Android Pie's unsung standouts. The update adds support for the 802.11mc Wi-Fi protocol, which developers can use to figure out where a device is in relation to nearby Wi-Fi hotspots. That sounds pretty dull until you realize that allows for easier implementations of indoor positioning and mapping. Because notches are definitely a thing now, Pie supports display cutouts in multiple configurations. If you've ever wanted to see what your phone would look like with top and bottom notches, or screens with corners cut out of them, a quick trip into developer settings will do the trick. There's no shortage of phones running Oreo with dual cameras, but support for multicam setups has been improved in Android Pie, so app developers can take advantage of that hardware, too. Android Pie now supports as many as five simultaneous Bluetooth audio connections, which is great if you've been trying to throw very specific kinds of parties. The battery-saver mode was always a lifesaver, but it draped the top and bottom of devices' screens in a hideous red-orange. Well, not anymore. If you select a snippet of text that Android recognizes -- say, an address or "Taylor Swift" -- the popup menu will offer to navigate or open a media app in addition to copying the text. Android Pie packs support for HEIF, a high-efficiency image format that makes photos smaller without affecting quality (much). It's hidden in settings, but a new Lockdown feature will disable fingerprint sensors and prevent notifications from appearing on-screen until you unlock the phone with your pattern or PIN. In other words, it's a way to prevent other people from snooping on your stuff without your express consent. Android 9 Pie is a massive update and, barring a few rough edges, a joy to use. Google has poured a tremendous amount of effort into making Android more thoughtful and more accessible. For all the great work Google did, though, its approach to gesture navigation and the small ways it pared some nuanced controls power users are enjoyed in the past will rub some the wrong way. For most people, though, Android Pie represents a cleaner, smarter kind of Android that will only get better when some key features go live in a few months.